To mark the centenary of the 1918 parliamentary elections when women voted and stood for election to parliament for the first time, the Royal Irish Academy presented the four female former Tánaistí: Joan Burton, T.D., Mary Coughlan, Frances Fitzgerald, T.D. and Mary Harney in conversation with David McCullagh to share their experiences of governing and gender in Ireland, particularly their experiences of holding the second highest role in government: Tánaiste. 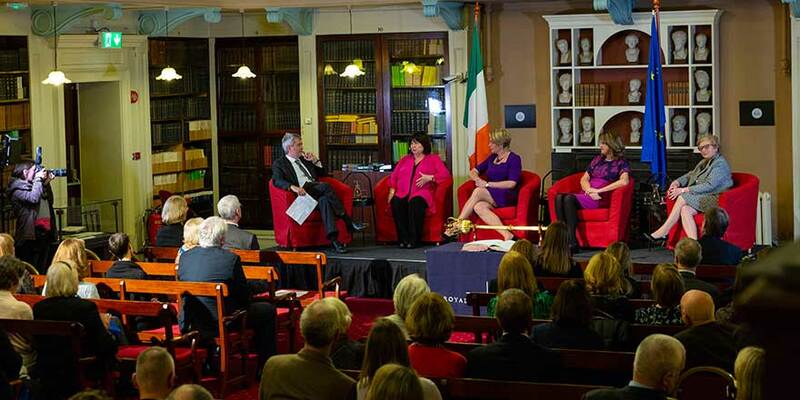 Separately, in advance of the event, Joan Burton, T.D., Mary Coughlan, Frances Fitzgerald, T.D. shared their views on the impact of gender quotas and their thoughts the need for the Academy to mark this centenary. Each of the Tánaistí spoke briefly before the discourse about their views on gender quotas and the importance of commenmorating and reflecting on the progress in our democracy, see the individual interviews below. Our discourse series is sponsored by Mason, Hayes and Curran. On 4 March 2019, Dr Michaela Blott, Xilinx gave the first 2019 Women in Leadership Masterclass at the Royal Irish Academy with the support of Accenture.